When our gorgeous old boy, Bill, started to struggle to walk any distance, we went hunting for a solution as he was too heavy to carry comfortably for both him and us. And we discovered that there is such a thing as a dog buggy/stroller. There are quite a few different ones out there…from eBay specials to high end rides…we ended up tracking one down at a local pet store. They are passionate about aged pet care, and provide products that can help the seniors enjoy life to the fullest… something which is very important to us. 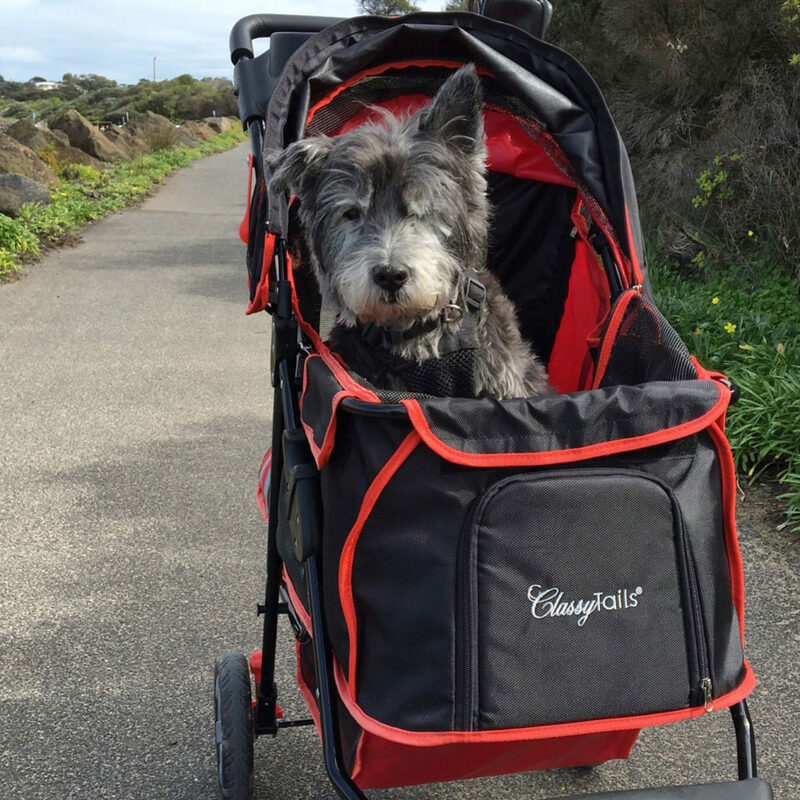 The 3 Wheeler Cruiser Dog Stroller is designed especially for pets…this particular model can fit 1 – 2 pets, up to 15kgs. 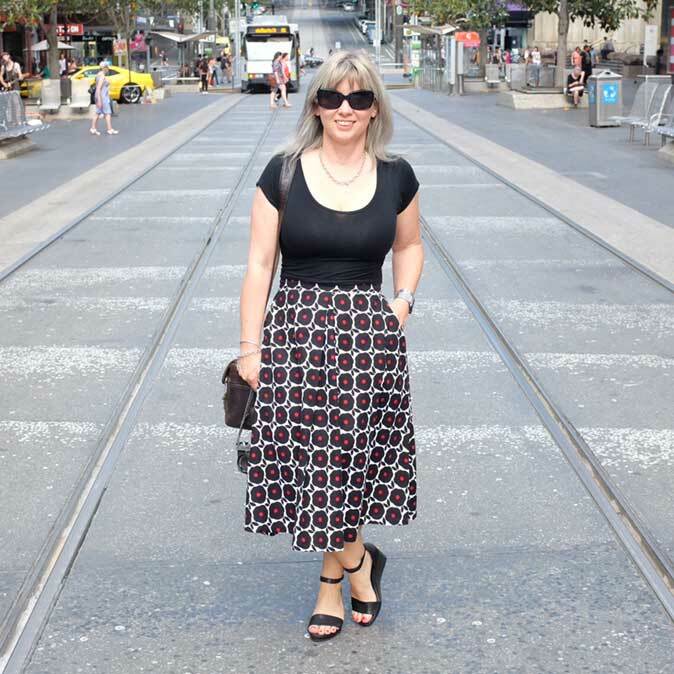 It has a lightweight frame with three wheels and just like a kid’s pram, it does fold down to fit in a car. There are two safety lease clips inside to ensure your furkid won’t suddenly jump out. 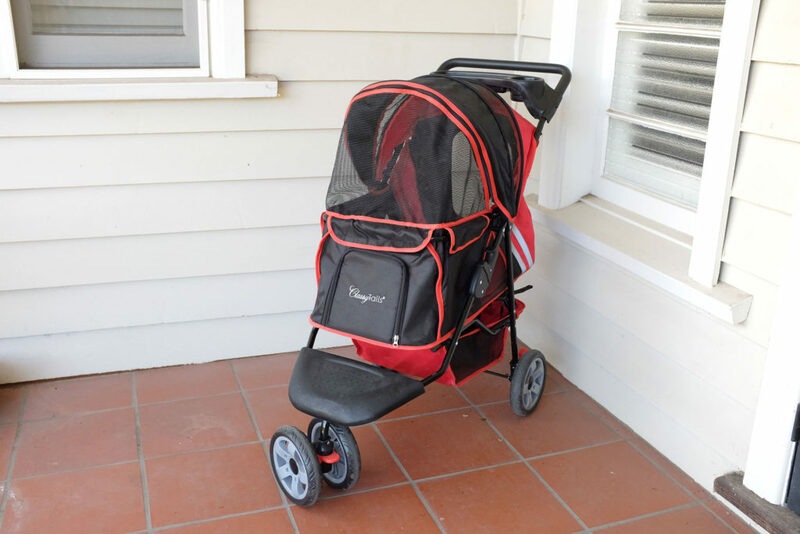 The stroller can be used for pups who aren’t ready to hit the pavement yet, through to being able to safely take your furkid out places that would be too difficult if they were on the lead. 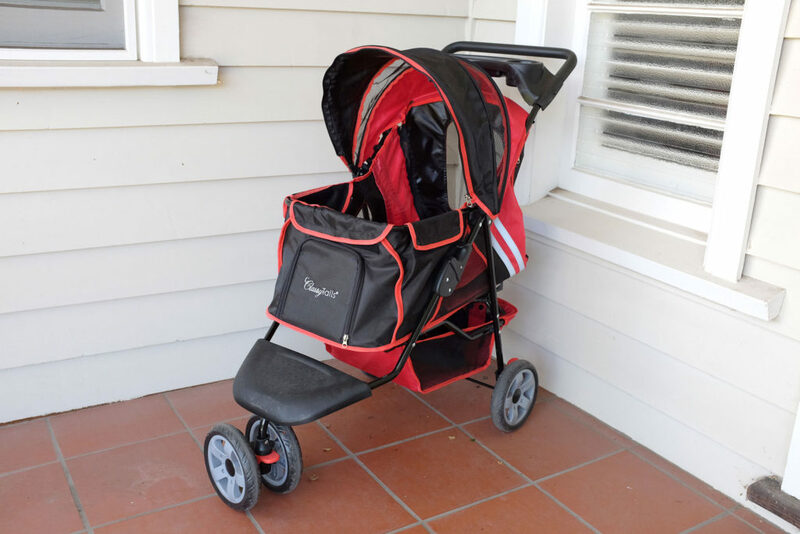 And of course, the stroller is perfect for the seniors, who hate being left at home when they can’t walk as far any more. We weren’t sure how Bill would go in it initially, but he was absolutely fine. There is a thin waterproof protector on the bottom which wasn’t nearly comfortable enough, so we put a pillow and a blanket in and he sat up as proud as anything! My husband took him for some early morning runs with Charlotte, and he seemed very happy, sitting up all the way watching the scenery go by. We also were able to take him for what turned out to be his last outing…a long walk along the beach with him in his stroller. What has been dubbed “Bill’s Buggy” has now gone into storage as Bill has now sadly passed away the day after the beach walk, but it will be brought out again when a new fluffy furkid eventually joins our little family. 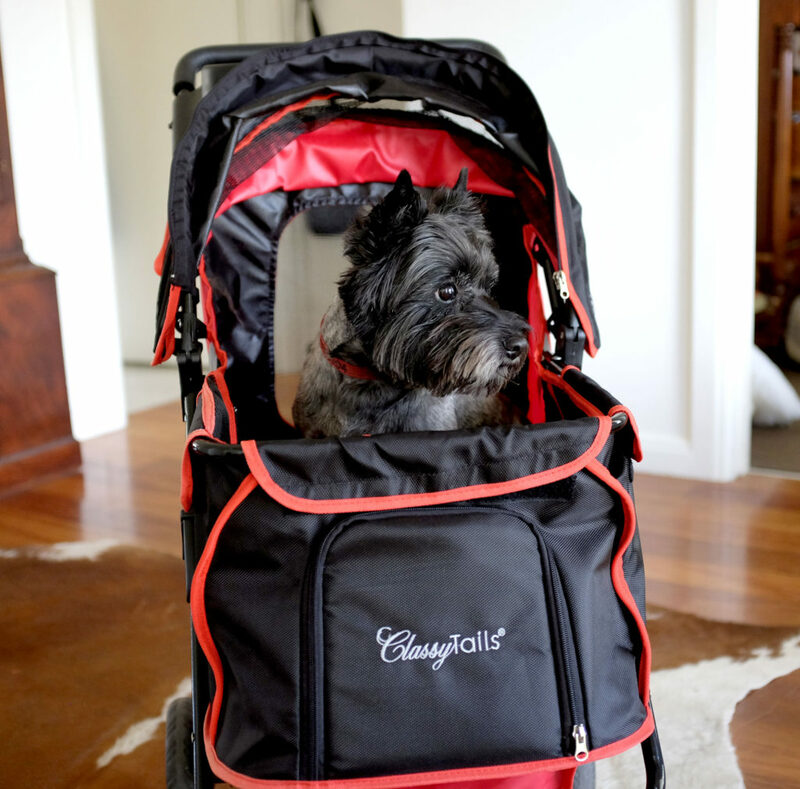 Click here to find out more about the Classy Tails Stroller and where to purchase.